Christmas dinners and lunches are for families and relatives getting together on the single day of the year celebrated with a serious abundance of special and traditional food served in 5 courses that take hours to finish. The best table linens are taken out, the crystal glasses and the silverware are all laid out beautifully. And like any other Italian table, food is foremost in the conversations. Washing up the dirty table linens come up often. There is a constant discussion on what method and product are best used in taking away the stains given by the red wine, red pasta sauce and chocolate which are always present in the menu. I grew up with the orange and blue bulls-eye logo of Tide. It was actually so popularly used in all households that the word Tide already took over the term laundry detergent. No one referred to laundry detergents anymore. It was just Tide. Now that I am a mother myself with laundry and dirty linens to take care of, I value these conversations on what the best way is to wash the laundry and remove the stains. Procter and Gamble laundry detergents and stain removers are foremost in all households, I noticed. Then this new advancement came out, to ease our laundry washing even more. 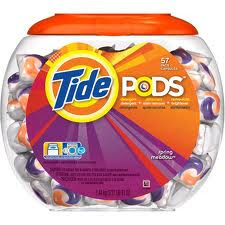 TIDE PODS. They don't take up so much space in the cupboards anymore. I remember buying and carrying the really gigantic buckets or boxes of laundry detergent from the supermarket to the car then to the house. And there was also the question of space. I would keep the large boxes or buckets in the garage and just scoop some in a container with a manageable size that I leave in the cupboard on top of the washing machine. With the pods, there is no more measuring and spilling. Just throw them inside the washing machine before the laundry. This goes for both front-loading washing machines and top-loading machines. EASY. These pods have three chambers: detergent, stain remover and brightener. They are protected by a clear film that when they come in contact with water, whatever temperature it is, even cold, it disintegrates. That works well for me because I wash the dark ones with cold water. Isn't there any reason not to like these pods? Okay, they are a tad more expensive that the regular powder or liquid detergent but I push that aside because I also pay for the convenience they give me. If you are still sticking to the liquid or powder, try them to see the difference. They come in 3 different scents. Spring Meadow, Ocean Mist and Mystic Forest. Order now from P&G eStore to avail their promos. Click on this link that will take you immediately to the P&G eStore. 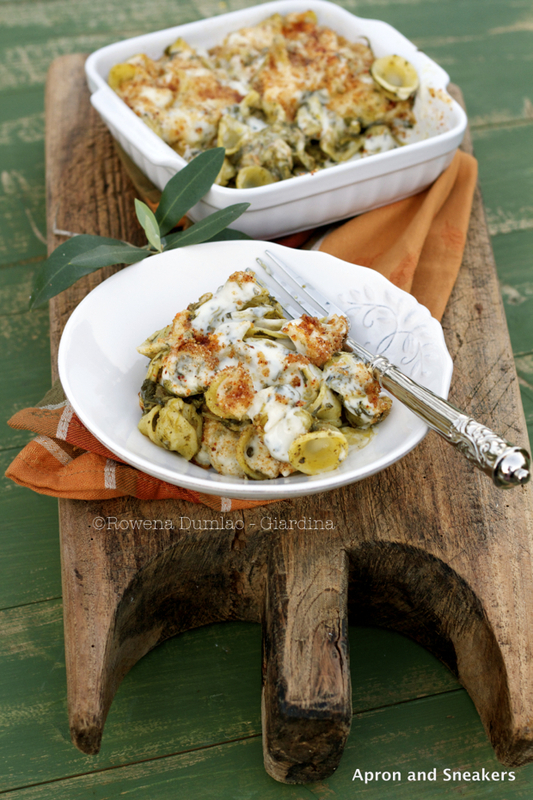 Now, let's speak about this baked orrecchiette. It is one delicious pasta dish, I am telling you. Cime di rapa (broccoli rabe) cooked with salted anchovies then mixed with salsicce (sausages) and made creamy with bechamel sauce was just purely delectable! 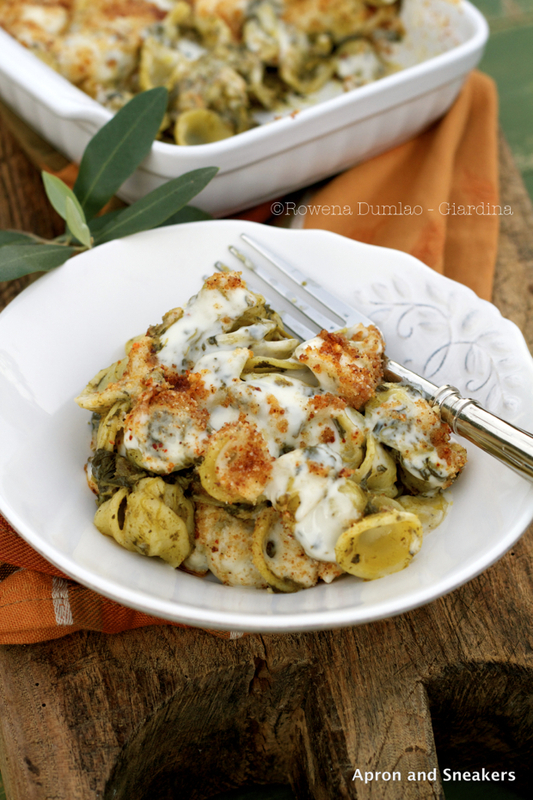 Other kinds of short pasta can be substituted if you really cannot find orecchiette but this pasta is really perfect for the sauce so I would suggest that you try looking for it. The ear-shaped pasta scoops the sauce really well. If you want to check out the lasagna version I did a couple of years ago, here's the link. Sautè the garlic & chili in a pan with extra virgin olive oil. When the garlic start to color, add the anchovies. When the anchovies melt, add the broccoli rabe. Cook for about 20 minutes on medium fire. Toss the vegetables frequently. Do not add salt because the anchovies are already salty. Throw away the garlic. Set aside. 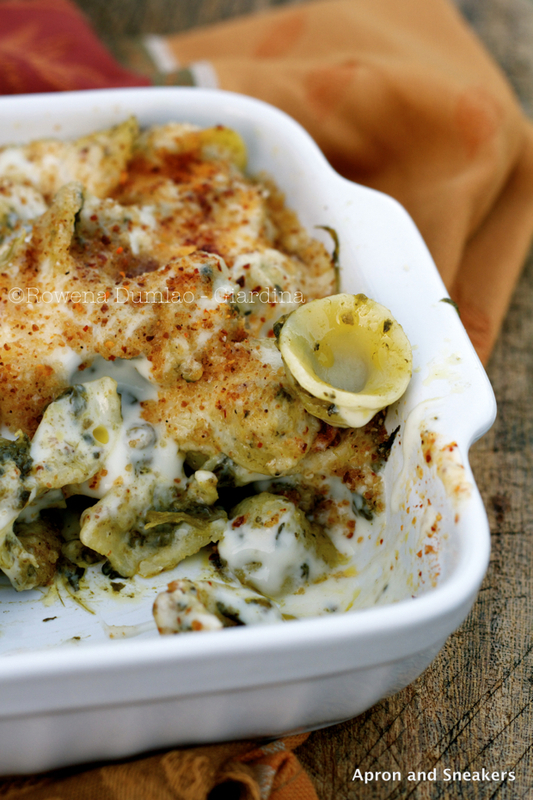 Prepare the bechamel sauce (see recipe below). Over medium heat, in another non-stick pan, cook the crumbled sausages until toasted well. There's no need to cook them in oil because the oil of the sausages will be more than enough. Set the sausages aside. Over high heat, bring water to a boil for the pasta. When the water boils, put some salt then the pasta. Cook following the number of minutes indicated in the packaging, lessening one minute because they still have to be cooked in the oven. If there is no time indicated, take them away from the water when they are al dente. Drain. Mix the cooked orecchiette, sausages and broccoli rabe. 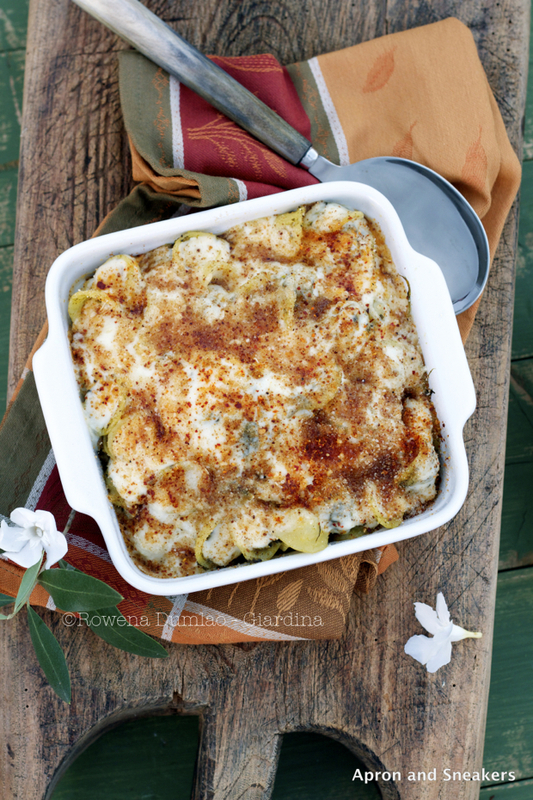 Grease the baking pan with oil then pour a thin layer of bechamel sauce.Transfer the mixed orecchiette in the baking pan. Pour all the remaining bechamel on the pasta. Sprinkle with toasted breadcrumbs and a pinch of piment d'Espelette. Drizzle with extra virgin olive oil. Bake in a pre-heated oven of 180 degrees Celsius for 15 - 20 minutes. Stir in the flour with a small whisk until the roux is thick. Add the milk and keep on whisking. Maintain a very low fire. Add the grated nutmeg and salt according to taste. Take away from the fire when the mixture becomes thick.